If your business has an archive of secure documentation, or generates paper based documents which require secure handling day to day, our On-site scanning service looks after their digitisation and organisation without the original documents ever leaving your premises. Docs-to-Data’s on-site scanning service is designed for situations in which it is either mandatory or preferable that documents remain on your premises rather than being removed for scanning. This could be to comply with security requirements, or because of the sheer volume of material to be scanned. Our expert technicians work on-site, scanning in your documents and then indexing and storing the digital scan files in line with the agreed procedures. Images can be uploaded to our secure hosted servers with management through our Electronic Document Management system, or to your own servers where we can install our EDM, or where you may already have a propietary EDM in use. If you have a large volume of documents in store on site, and do not wish to go to the trouble of having these boxed up and removed (though we would of course be happy to do that for you), we will bring suitable scanning equipment to your site, along with scan technicians, and work our way through the documents. Once they have been scanned we can return the papers to your original storage area, or can remove them from your site and arrange for secure destruction. 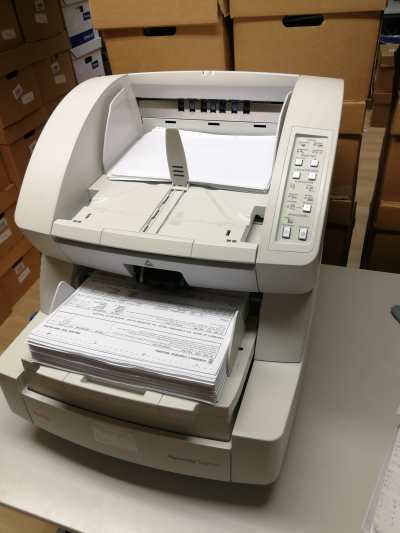 If your business generates a paper document flow requiring scanning on a continuous basis, we can install a permanent scanning facility at your site. Once this has been installed, we can either provide a technician to undertake your scanning on a regular basis or, if the volume merits it, you can outsource the function to us and we will embed a fully trained technician permanently at your site to manage your scanning. If you have already invested in scanning hardware but are having trouble finding, training or retaining technicians to operate it, we can provide equipment, technicians or both on an outsource basis.